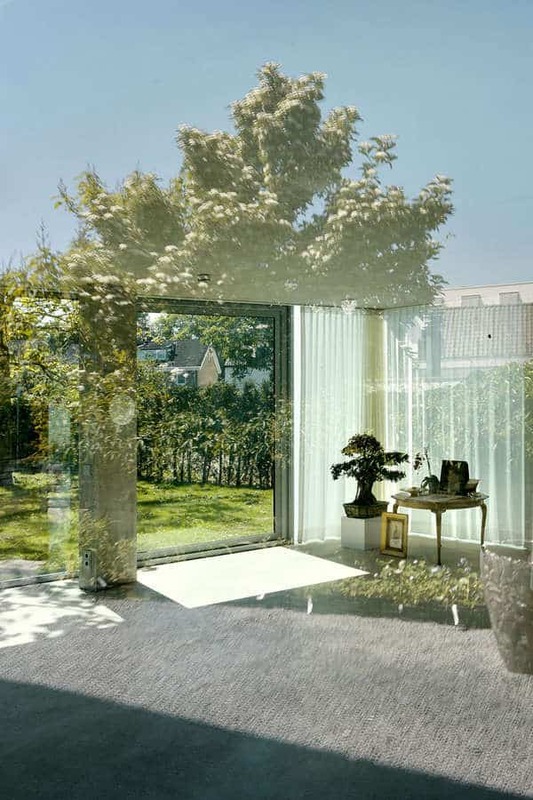 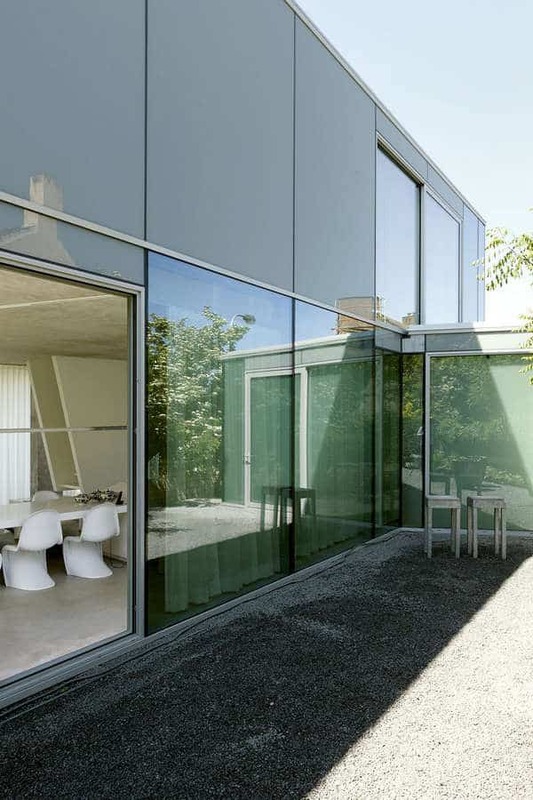 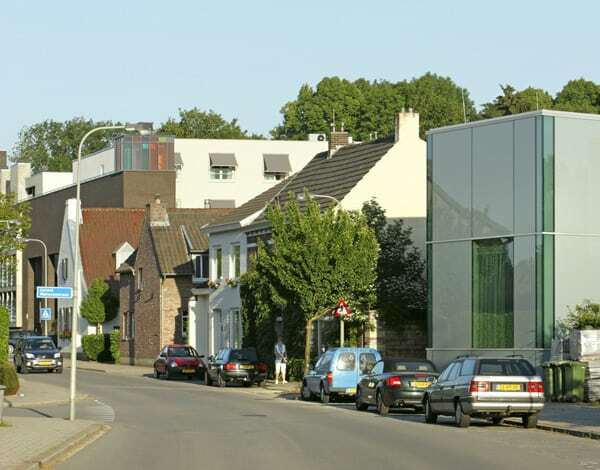 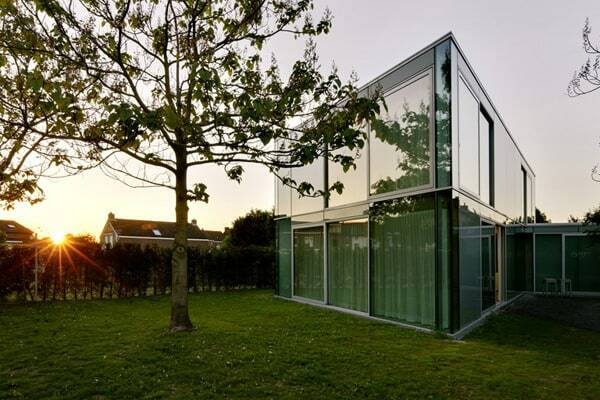 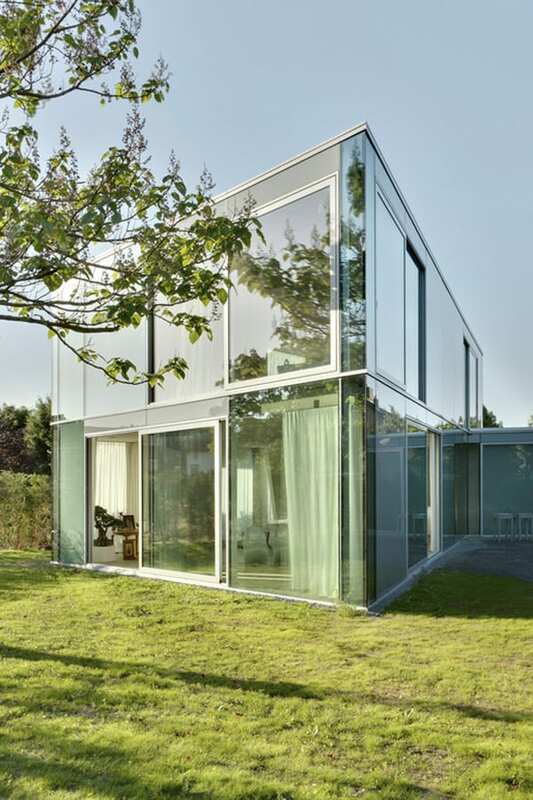 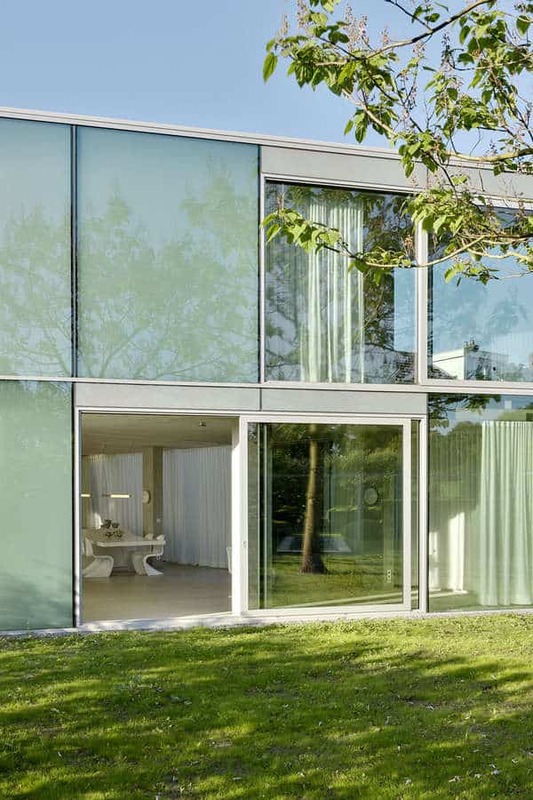 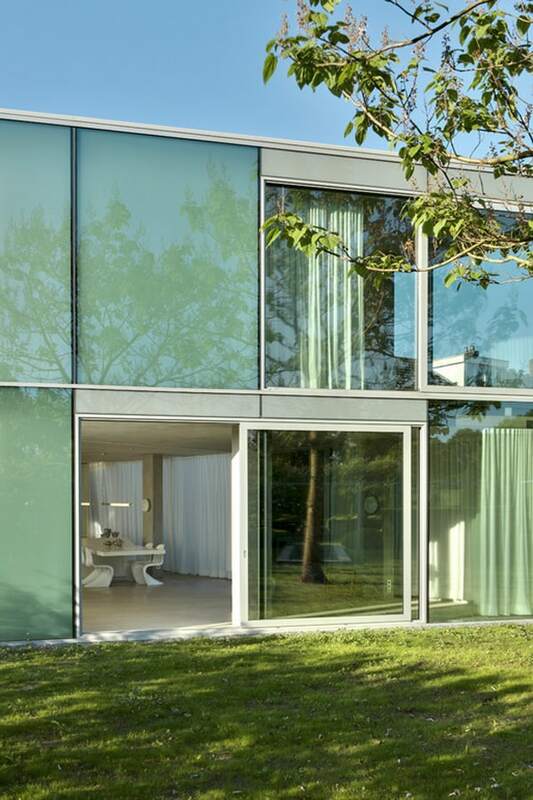 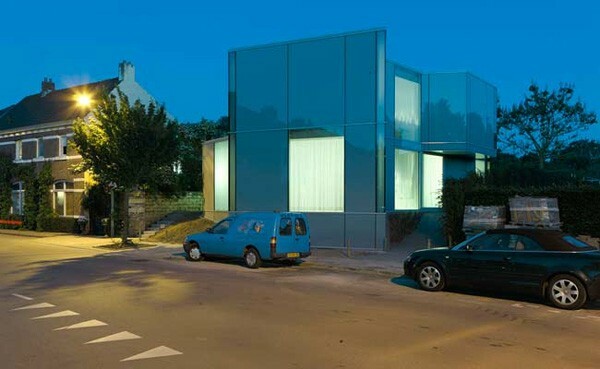 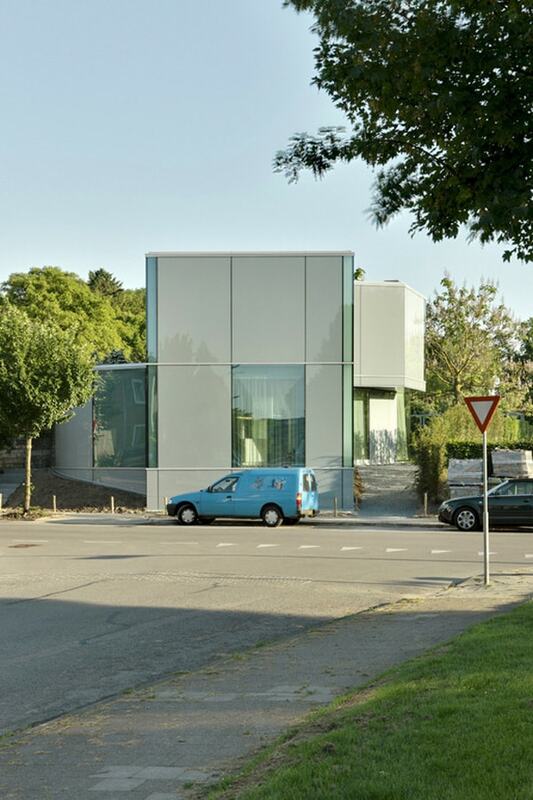 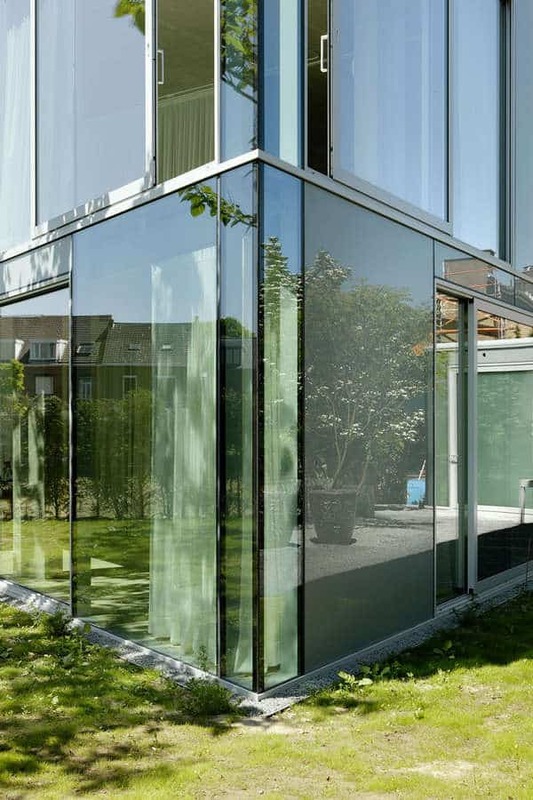 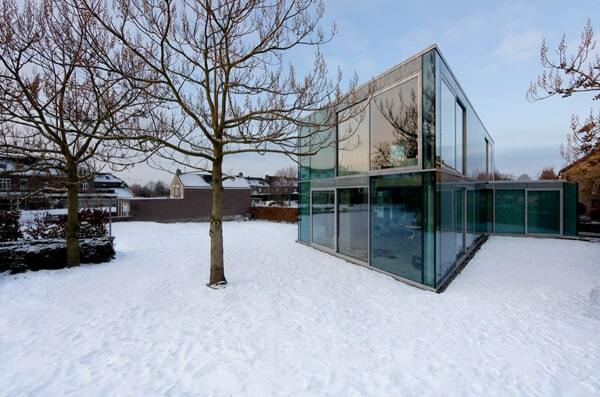 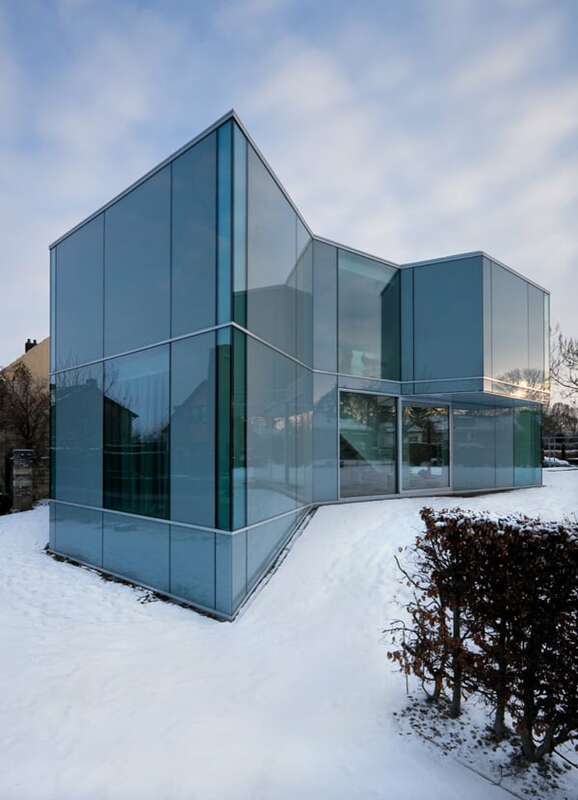 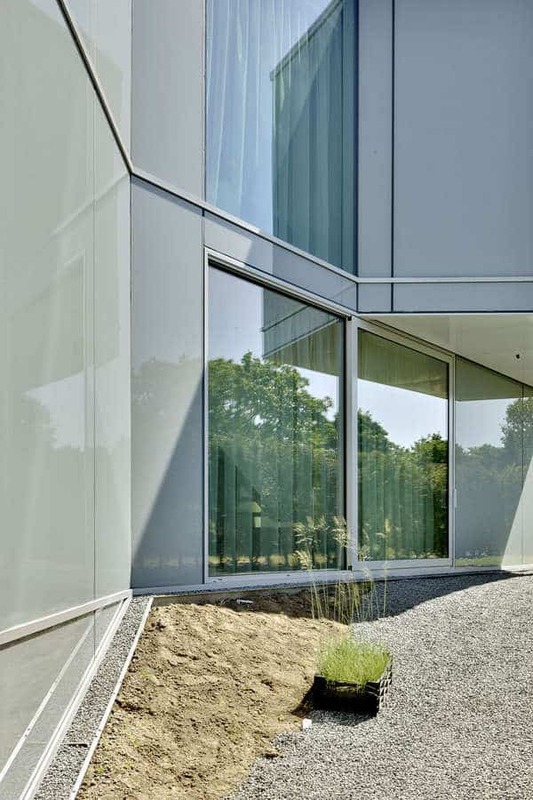 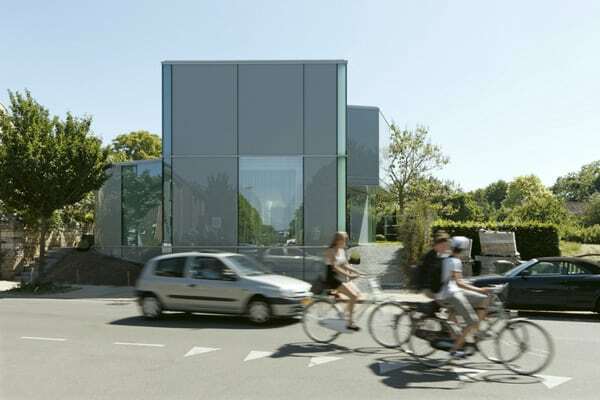 H House features a modern glass facade designed by , situated in a leafy area of suburban Maastricht, The Netherlands, just south of the city’s center. 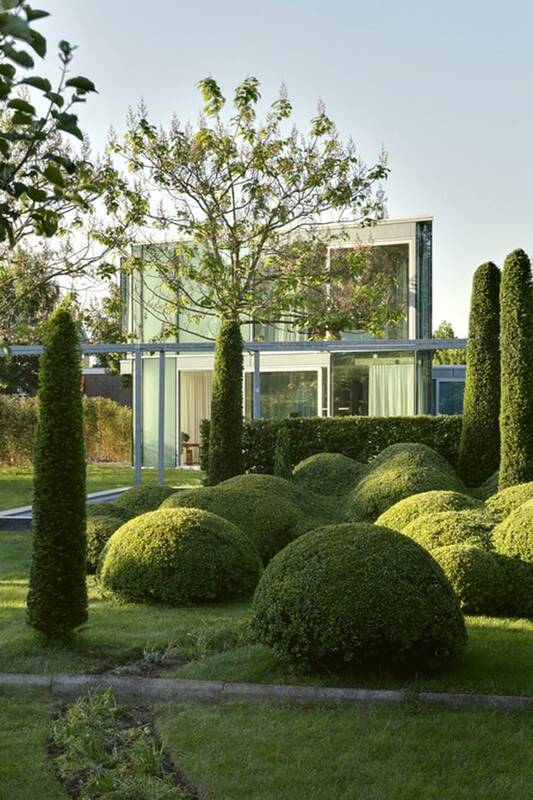 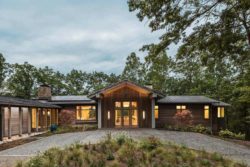 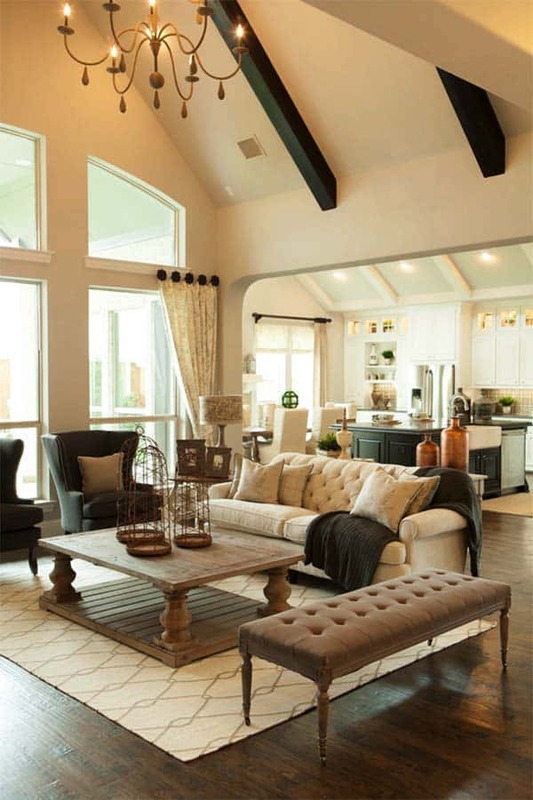 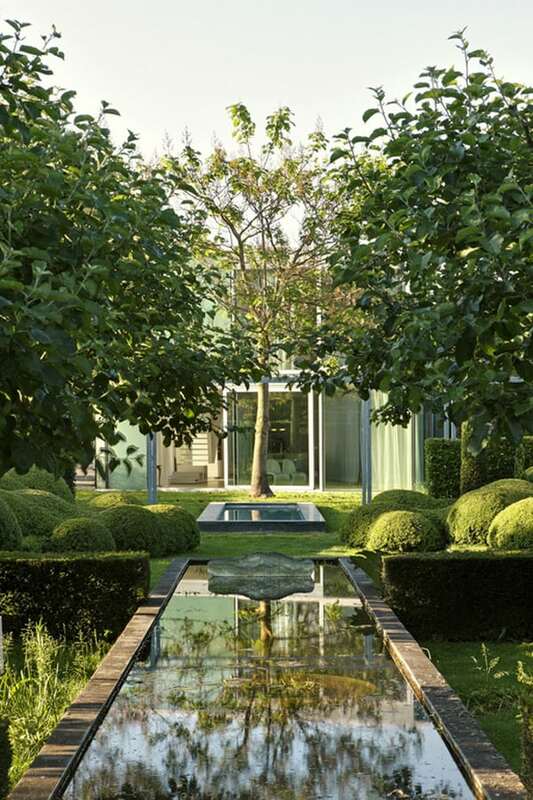 The homeowner’s are a dancer and an actor, who are also landscape architects, locating the 3,229 square foot (300 square meters) home within an existing formal garden that the owners had cultivated over the years. 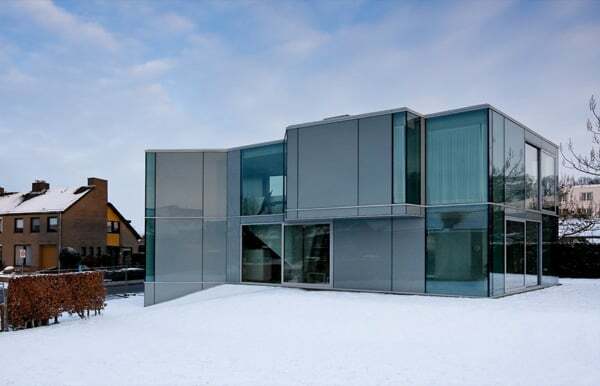 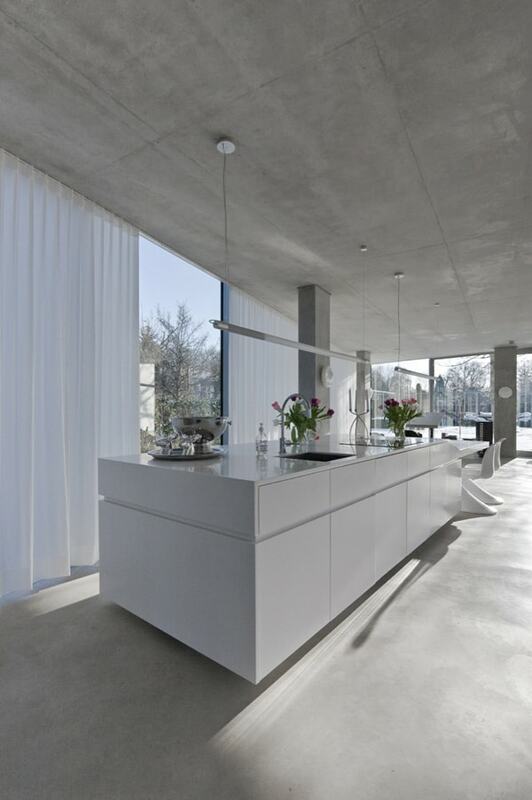 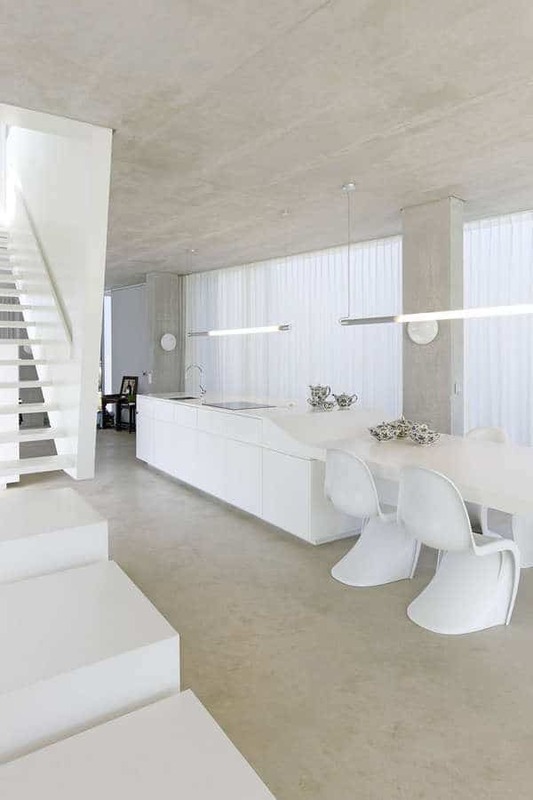 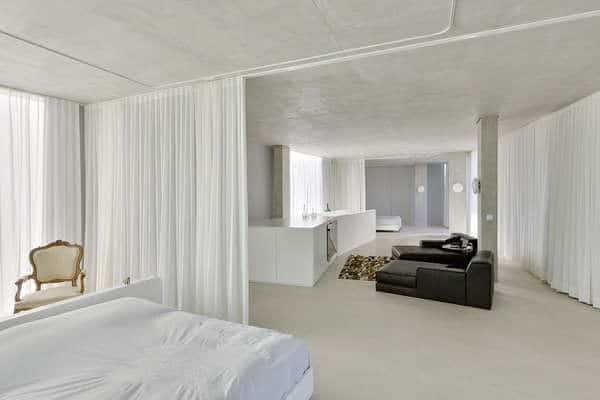 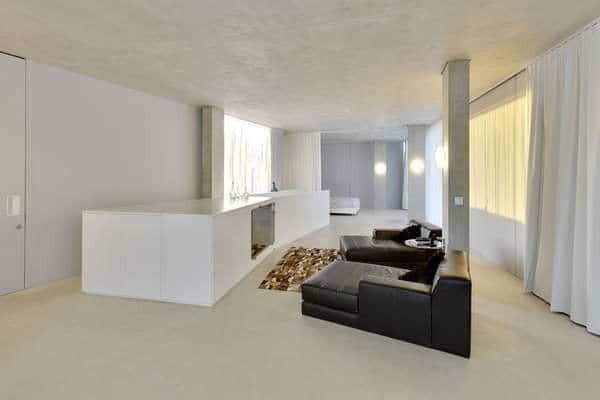 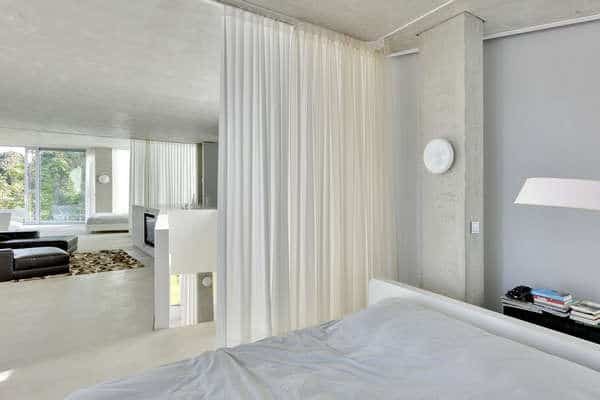 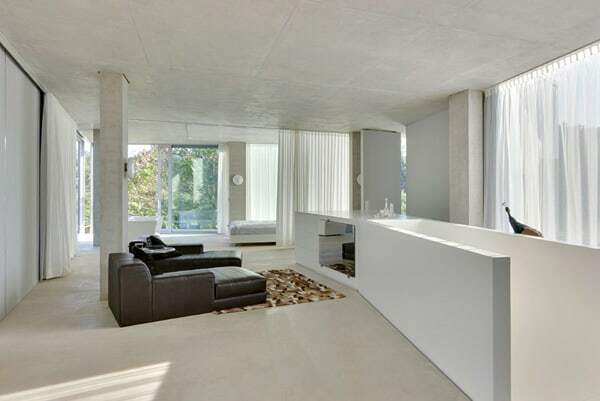 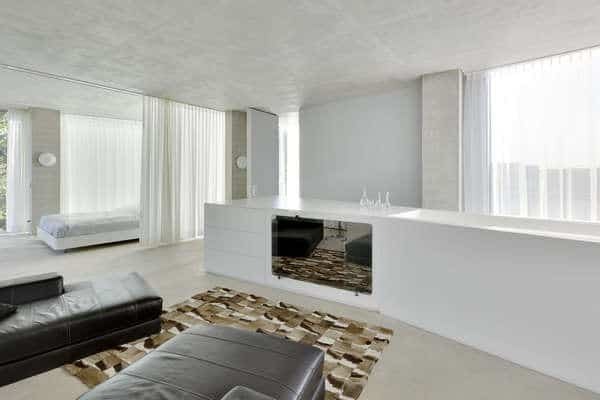 Composed of two concrete floor slabs wrapped in an all glass skin that varies in shades of opacity–from transparent to opaque–the interior is organized so that it assumes the characteristics of a single, open, loft-like space. 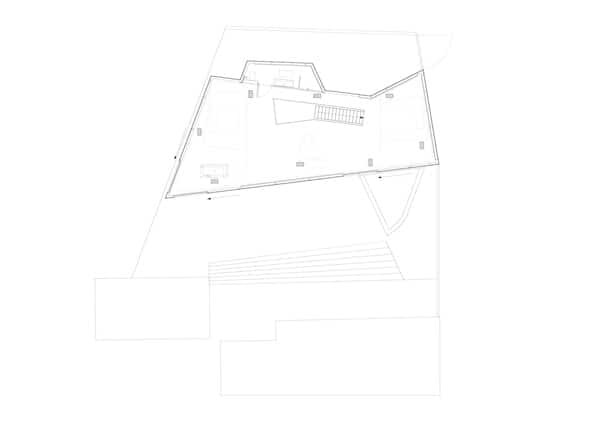 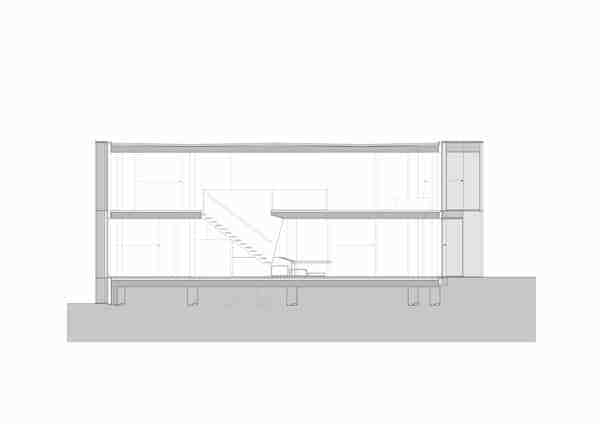 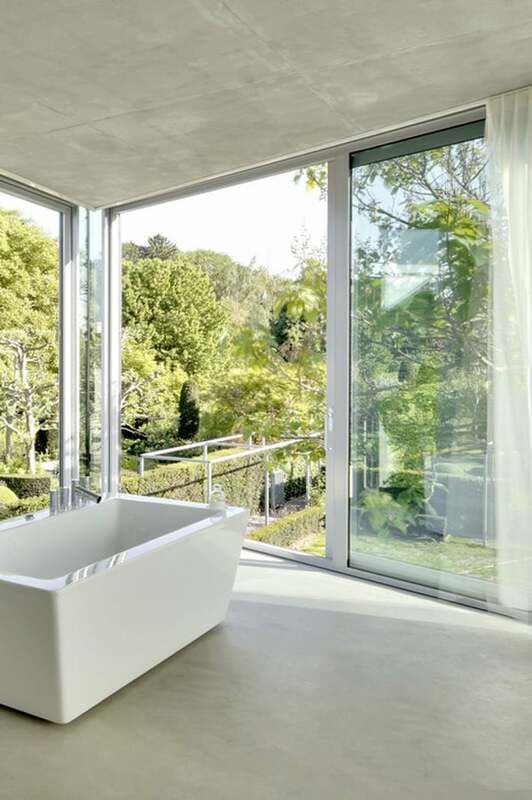 The two exceptions to this completely open living situation are the contiguous volume of the upper story bathroom, which cantilevers over the terrace entry off the kitchen below, and that of the front entry, which projects from the main volume to create a roof terrace. 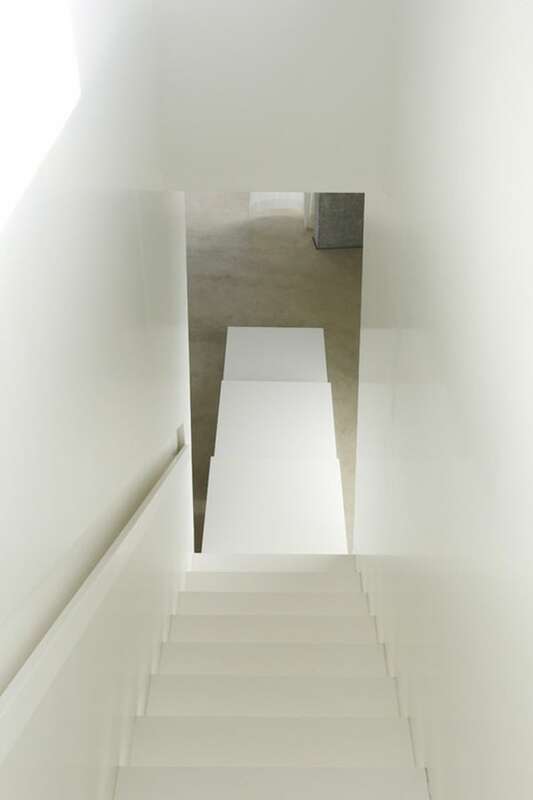 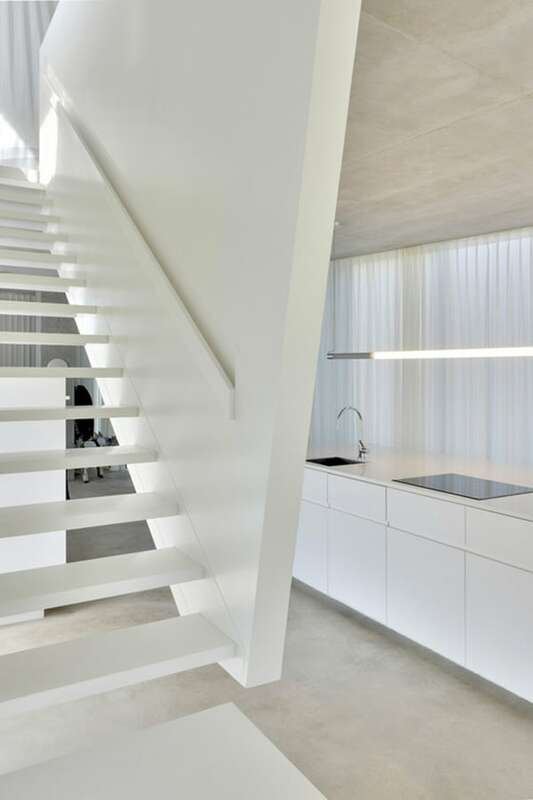 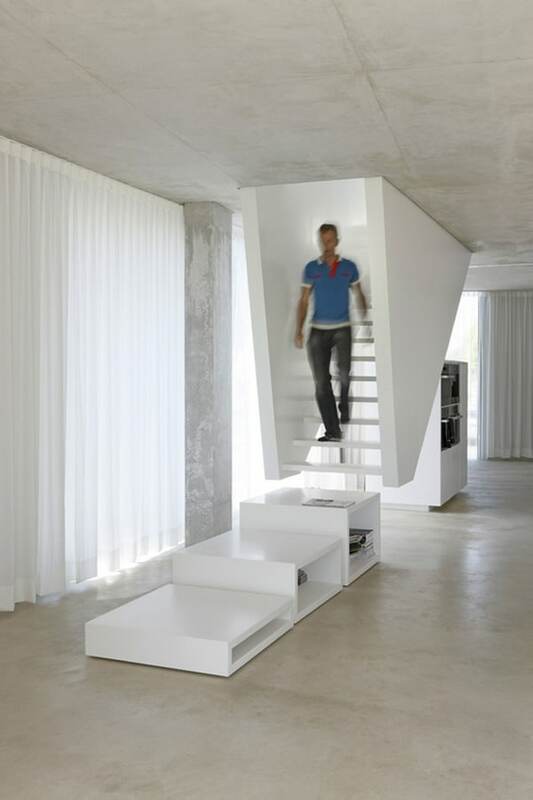 The house’s staircase is suspended from the first level so that it does not touch the ground floor; its lower portion is composed of movable units that also function as storage for the ground floor kitchen and living space. 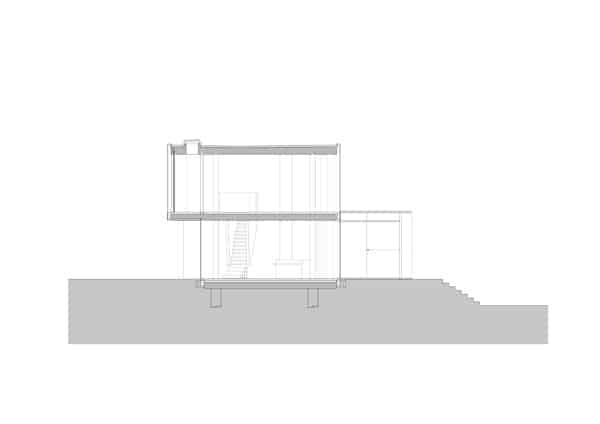 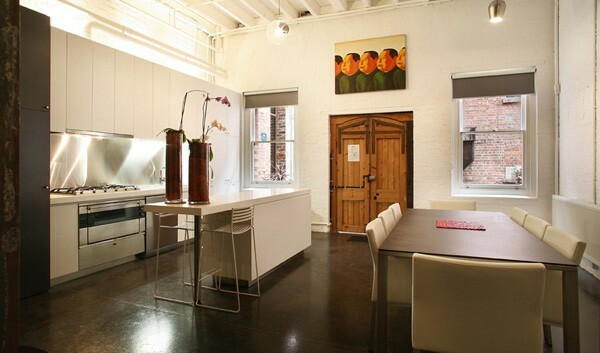 Small rectangular columns support the house’s concrete slabs. 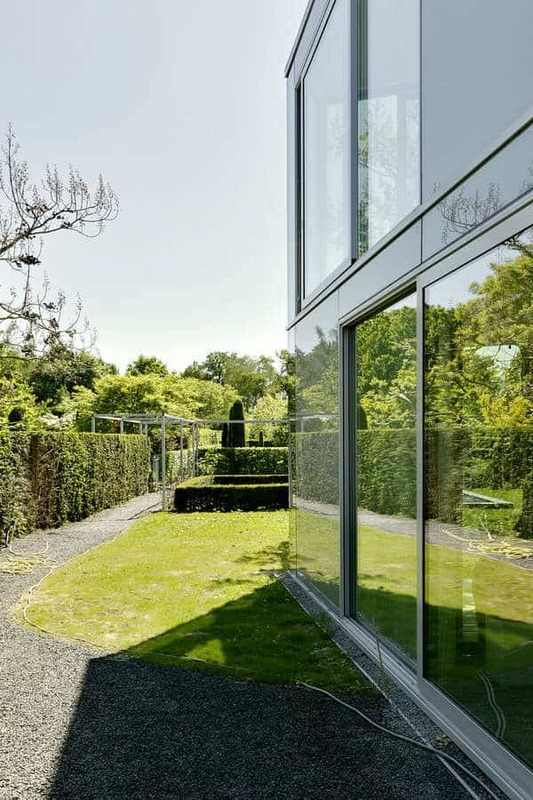 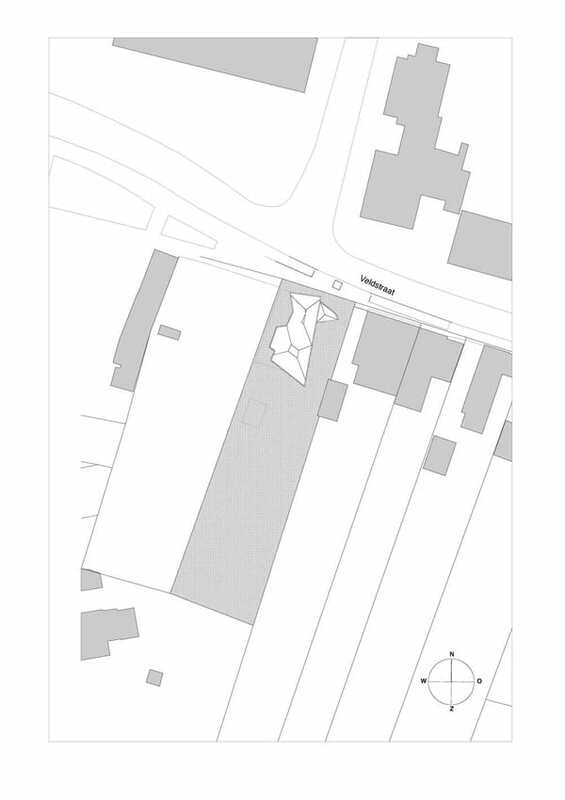 The owners are able to reconfigure their interior spaces, due to the numerous curtains–whose tracks are recessed within the floor slabs–and the lower components of the staircase; ephemerally defining rooms reflective of the seasonal changes within the surrounding formal garden. 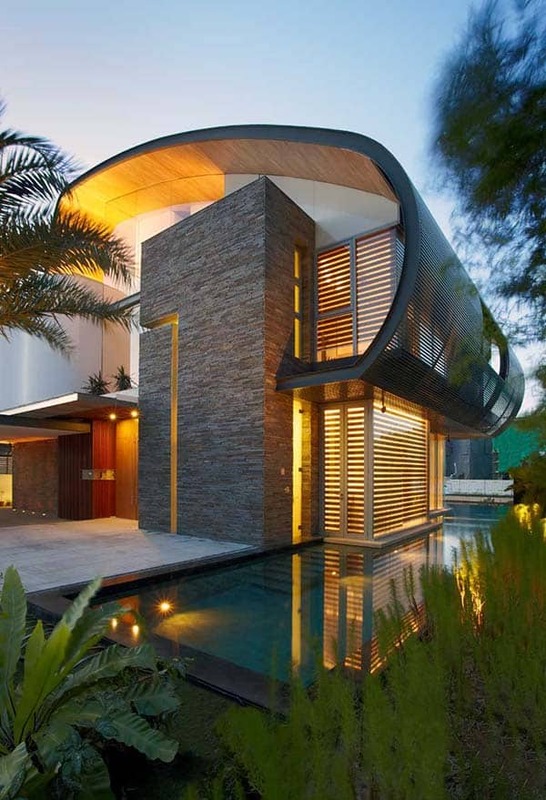 Incroyable ! 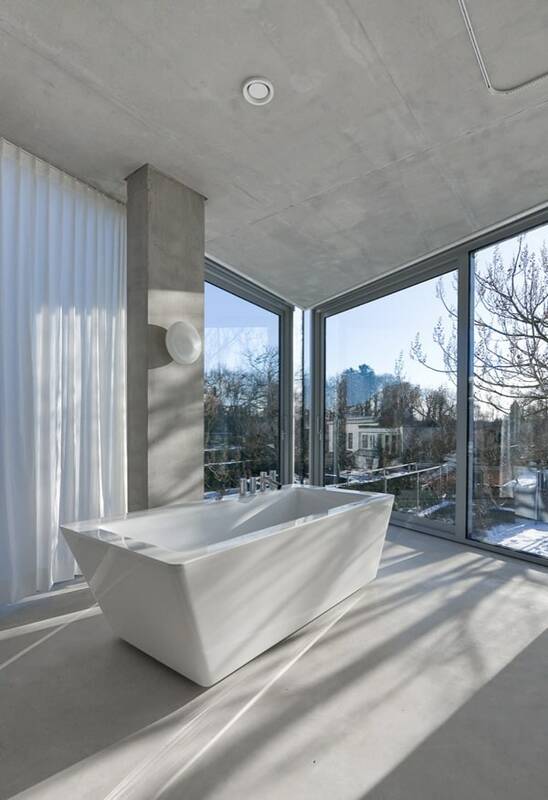 Le contraste avec le blanc de la neige ou le vert de la végétation est saisissant ! 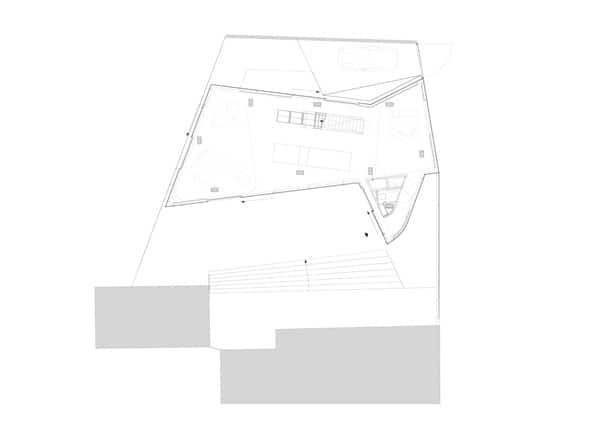 A partager sur les réseaux sociaux !